Dale Fisk was inducted at Ft.Custer, MI. He went from Ft Custer to Shepherd Field for Basic training; from there to Scott Field for more training. From there he went to Truax Field in Madison, Wi. for further training.Then Fairmont Army Air Base, Ne. as control tower aircraft dispatcher for about 4 months. The next stop was Peterson Field, Co. From Peterson Field [Colorado Springs, Co.] it was off to to Ft. Lewis [Seatle,Wa.] via troop train. Then 3 days after arriving at Ft.Lewis, they boarded the USS Nordam for their 32 day voyage to Guam. For the top brass of 314th Headquarters headed for Guam by air from from Hamilton Field. Top left photo is Dale on Guam 1945; below left is Dale while at Ft. Custer in May 1943. Dale and his wife Annie reside in Lakeland, FL. and have been regulars at the 39th Bomb Group (VH) reunions for the last few years. 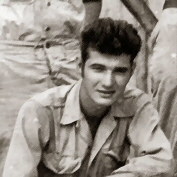 Of the group pictured above Dale was the only one to continue on the 314th Bombardment Wing.